It’s hard to explain why our roofs and their underlying structures have presented us with so many challenges. The answer lies not at the time of construction in the 1770’s, but before that when the colonists in Maryland and Virginia were trying to build their first houses in the 1600’s. Imagine the lush 17th century wilderness with lots of trees ready to be cut down for your house. You know how to cut trees down; it’s what follows that’s the challenge. You remember what houses in your village in England looked like and how they were built. So what do you do next? One of the first things you realize is that you have to build your house quickly – unless you like sleeping in the rain or shivering in the snow. You also know that feeding your family depends on successfully growing and harvesting a crop of tobacco and that this takes up most of your time. Therefore you have to build your house in the short time you have before winter, plus you have to be very mindful not to let your construction interfere with the cultivating, harvesting, and selling of your tobacco. So do you try to copy the English houses you remember? It sounds logical, but it isn’t for one huge reason. There are not enough skilled carpenters or masons in the Chesapeake region to build an English house. The reason you need a carpenter is because they know how to cut down trees, shape them, and join the timber together by a rather complicated system. These trees are now beams, posts, and rafters, and they will make up the skeletal structure of your English house. You also have to put this structure on a foundation of stones or bricks so it won’t rot or get eaten by termites. You might be able to cut down the trees and shape them after a hard day’s work picking off tobacco hornworms, but the one thing you probably can’t do is create the complicated joints needed to hold together the big timbers. This is the work of skilled carpenters and they are practically non-existent in the wilds of the Chesapeake frontier. So what do you do? What you do is build what your neighbors have built, which is commonly known as a Virginia house. So what is a Virginia house? The Virginia house is a small one-room house which is built of relatively small posts (verticals) and small beams (horizontals) with a roof of small rafters (diagonals) and covered with small pieces of wood called clapboards. How is this Virginia house different from an English house? The answer is that a Virginia house is puny, insubstantial, and is going to rot quicker than the standard 17th century English house. So why would anyone want to build a house like this? The answer is that it’s quick to build, it’s not going to take you away from your precious tobacco crop, and the small posts, beams, and rafters can be nailed or pegged together without the need of a carpenter. It is also very much cheaper to build than a proper English house which means the money you save can be used to buy that prime tobacco-growing property next door. So what does this have to do with the Hammond-Harwood House roof which was built roughly 200 years later? This also takes some explanation, so bear with me a little longer. The Virginia house was built by sticking posts directly into the dirt and then by putting a beam across the tops of the posts. This beam is called a plate and this is what the roof is attached to. The walls are held together at the top by horizontal beams called cross ties if they are big or joists if they are small. These keep the long parallel walls from falling inward or outward and create the base of the strong triangle that the roof covering rests on. Now we are getting to the crux of the matter! In building the English house large posts, large plates, large cross ties and joists, and large rafters are held together with complex joints which in the 17th century were almost solely the work of a carpenter. In the Virginia house the rafters are not nailed directly onto the plates; the cross ties and joists go over the plates and stick out to create an eave on both sides of the house. 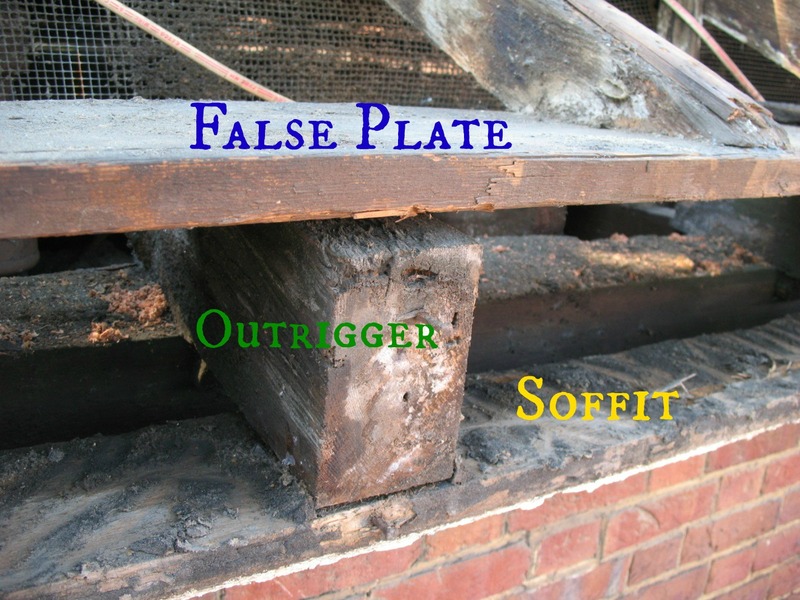 The tops of these cross ties and joists that stick out provide the Virginia house builder with a place onto which a smaller flat plank – not a big beam – can be nailed to create a flat surface onto which you can nail the ends of the rafters. This means that you can use smaller (common) rafters rather than the much larger (principal) rafters used in the proper English house. Essentially the difference between the English house and the Virginia house is – aside from the size of the wooden parts and the clapboard covering – the way the bottoms of the rafters connect to the walls of the house. The Virginia house system uses a flat timber plank which is laid on the tops of the joists that are sticking out from the tops of the walls. This new flat plate is called a false plate and is distinct to the architecture of the colonial Chesapeake. So how does this relate to the Hammond-Harwood House’s roof? The answer is that the false plate becomes an integral part of colonial building in the Chesapeake region and continues to be used even when buildings become very complex and more like contemporaneous buildings in England. It reminds me of the coccyx bone in the human body because it’s a vestige of a skeletal past that remains even after its usefulness is gone. Now in our case we have brick walls and a light (common) roof structure sitting on top of them. If this house had been built in London in 1774 it would have a principal roof of stout wooden parts with sturdy rafters which would connect directly to robust horizontal plates, but it wasn’t built in London, it was built here in Annapolis and it was built with a slight yellow pine roof structure with a false plate. The Hammond-Harwood House has stout 6 x 8 plates and puny 3 x 3 3/4” rafters that are nailed directly into a 1 1/4” x 9 3/8” false plate which is nailed to short stubby outriggers which are in turn dovetailed into the plates. This, combined with the substitution of outriggers for cross ties, has caused the majority of challenges that we have had to deal with in the wings of the Hammond-Harwood House. What has happened in our case is that the weight of the roofs – wood, metal and slate – has caused the rafters to push down on the false plate, which in turn has lowered at its outer extremity causing the stout plates to rotate outward and causing the lower points of the rafters to rise away from the false plate and expose their nails. Our challenge has been to take the weight off the roof structure, so that the plate will not roll outwards and make the tip of the rafter come up and away from the outrigger. This situation occurs because our vestige of the Virginia House – the false plate – has been applied where another form of roof to wall connection would have been a better choice.